Someone tried to break into my house today. Tried is the operative and oh-so-important word in the previous sentence. Some times you try and succeed. In this case, thankfully, the person or persons who tried failed. Want to know what makes me angry about this situation? It's not replacing the deadlock that was torn partially out of the front door and left dangling, now ruined. 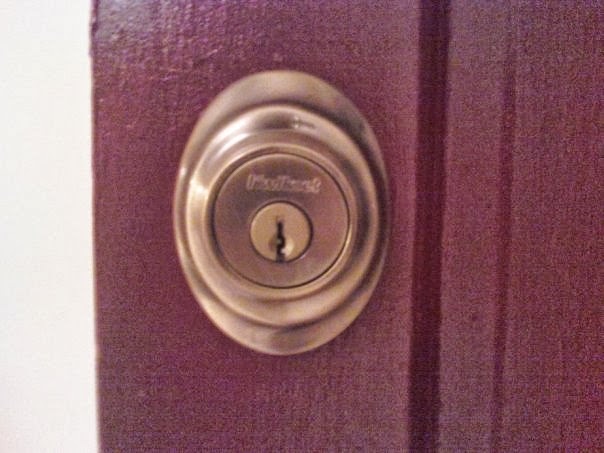 The deadlock that was the very first thing my husband - then boyfriend - and I purchased for our new home after signing the paperwork almost 4 years ago. because we were excited to take the first step in securing the house we'd live in together. It's not the time spent waiting for the police to come this evening so we could file our report. Nashville is not a huge city, but the police here are busy and, thankfully, our situation was not an emergency. I didn't mind waiting and the officer who came was polite and thorough. It's not even the fractured sense of security that accompanies the idea of someone willfully attempting to violate our sacred space, because the security of our home held. The would-be invader(s) never made it inside our house and, to our knowledge, disturbed nothing other than the lock. Again, we are fortunate. What makes me angry is when the attempt occurred. The attempt occurred between 11:30 a.m. and 1:30 p.m. Mid-day. But it's not the daylight hours alone that bother me, it's the fact that my husband works from home. Nick's home office is directly beside the front door. Although I work outside the house, my office is under 5 miles away, and I come home frequently for lunch. I also work at home from time to time. My point is, my home is not sitting vacant for hours a day. We were able to pinpoint the timeline, because Nick was home ALL day, except from 11:30 a.m. to 1:30 p.m., when he had to run some errands. Now, it's entirely possible this was a random attempt and the perpetrator just got lucky, happening upon our home during the small window of time Nick was gone. But I'm a fiction writer, and if coincidences in plots are suspect, coincidences in real life are down right out suspicious. It seems far more likely this was an attempt made by someone who's been watching the neighborhood, if not our house specifically. Someone who's been monitoring routines and keeping an eye out for opportunities. Someone looking to do harm. Planning. Waiting. Watching. Yes, I'm angry. I told my neighbors what happened, warned them to be extra careful with their own routines and habits. I called the police, just so they have a record of an incident in the neighborhood. And then? 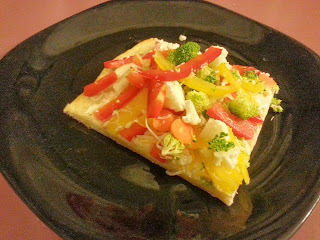 Then I made a vegetable pizza. I gave my son a bath and read him some new stories we've been saving. I played Nintendo with my husband. I may be angry, but I'm more grateful that nothing truly bad happened. Happy my husband was away and my child safely at daycare. Thankful I decided to have lunch out with a friend today, rather than returning home for lunch at noon, as was my original plan. We are fortunate and I am thankful. And although I do get angry if I dwell on it too much, I refuse to be afraid. This is our house, our little corner of the universe. We went through the nightmare of closing. We fixed the fuse box that first winter when it blew anytime the heat was set higher than 65 degrees. We replaced the roof when it leaked enough to provide a convenient, if unnecessary, in-living room pool. We demoed the detached garage with nothing more than sledgehammers, attitude, and a VERY generous friend. And now, now we'll repair a broken deadbolt. Because at the end of the day this is our home, and no coward is going to change that.